WIESE pendulum bucket conveyors feature exceptionally low-maintenance and low-wear operation. The original WIESE rubber chain is used in all of our systems to drive the conveyor element. The basic structure of a pendulum bucket conveyor comprises 2 WIESE rubber chains running in parallel and the pendulum buckets suspended between them. As the name suggests, the buckets are able to swing. There is no connection between neighbouring buckets, which means that each bucket can be individually tipped or rotated. In the horizontal sector and especially at the product handover point, the buckets touch, creating a self-contained, seamless conveyor belt. This allows a continuous delivery of product with a minimized risk of product losses. The swinging buckets remain in a horizontal position, regardless of their location and speed. This is what produces the major advantage of a pendulum bucket conveyor: all manner of different lines with multiple drop-off points. 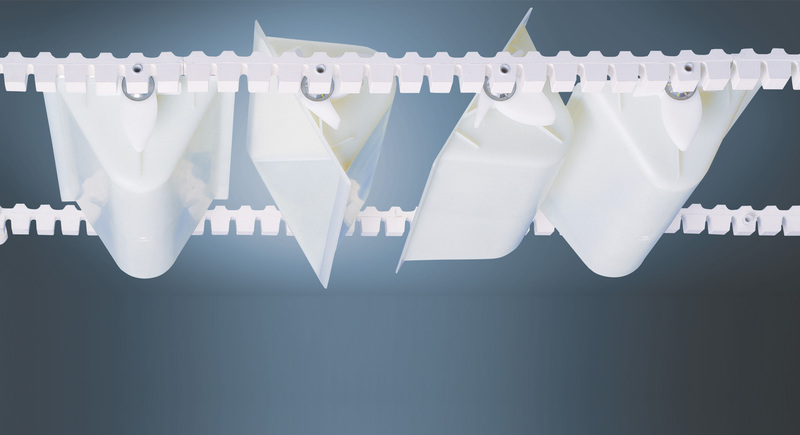 With a pendulum bucket conveyor, there is no restriction to the simple Z-shape. C, O and T-shapes are also possible. It is also possible to transport filled buckets entirely within the loop in order to provide a buffering option. However steps must be taken to avoid double filling or, to be more precise, overfilling. The buckets and chains are available in a wide range of different materials. The buckets can be designed in food-grade, detectable and/or conductive materials, entirely in accordance with the requirements of the application in question. 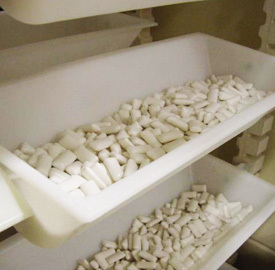 The detectable version ensures a high level of operational reliability and helps to avoid product contamination, a quality that is useful for more than just the food industry. The outstanding feature of the WIESE pendulum bucket conveyors is the ability to mount and remove the buckets with just a few operations and no need for tools. This is especially useful for frequent cleaning arising from regular product changes, for example. 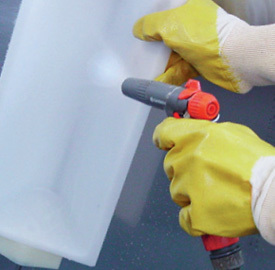 A second set of buckets is commonly kept to quickly and easily swap the "dirty" buckets for the clean ones when product changes are made, allowing downtimes to be kept to a minimum. As already mentioned, pendulum bucket conveyors can be designed with multiple drop-off points. These drop-off points are generally controlled using compressed air supplied via a cylinder. This means that multiple stock silos, or even multi-head scales or packaging machines can be loaded. Another tremendous advantage of pendulum bucket conveyors is their ability to transport bulk materials that have already been weighed or counted. In this instance, the pendulum bucket conveyor can be the perfect link between multi-head scales or counting machines and the associated packaging equipment such as tubular bag machines. 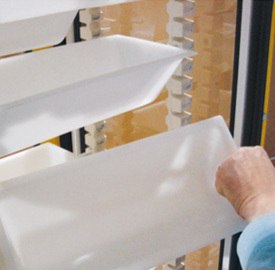 With pendulum bucket conveyors, you can be reassured that whatever was filled in at the bottom also arrives at the top. No more, no less. WIESE pendulum bucket conveyors are especially suitable for the gentle and hygienic transportation of bulkable and pourable foodstuffs. The interaction of the food-safe, corrosion-resistant and lubricant-free WIESE rubber chain and the easy-clean pendulum buckets has been satisfying the exacting demands of a range of food manufacturers for many years. 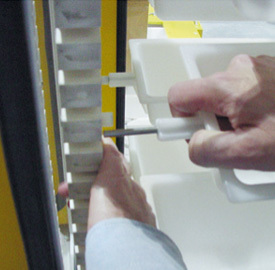 Customers' experiences are of course factored in to the constant development and improvements, especially during the development of easy-to-clean machine housings with optimised service and cleaning hatches through to detectable plastics for product-contacting parts such as the buckets themselves. Our bucket conveyors can of course also be equipped with CIP cleaning stations. With the CIP station, buckets and chains can be automatically cleaned either with compressed air or water.